✔ 6 pages✔ Gold metal corners✔ Color: black✔ Dimensions: 8-1/2" x 11"
$0.70 Winco PMC-5K Black Single Menu Cover 5" x 8"
$0.70 Winco PMC-5U Burgundy Single Menu Cover 5" x 8"
$9.75 Winco LMD-811BK Black Leatherette Two Panel Menu Cover 8-1/2" x 11"
$9.75 Winco LMD-811BN Brown Leatherette Two Panel Menu Cover 8-1/2" x 11"
$9.75 Winco LMD-811GY Gray Leatherette Two Panel Menu Cover 8-1/2" x 11"
$10.64 Winco LMD-814BK Black Leatherette Two Panel Menu Cover 8-1/2" x 14"
$10.64 Winco LMD-814BN Brown Leatherette Two Panel Menu Cover 8-1/2" x 14"
Elegantly showcase your restaurant or food establishment specialties on the Thunder Group PLMENU-6TGI 6-Page Book Fold Black Menu Holder 8-1/2" x 11". 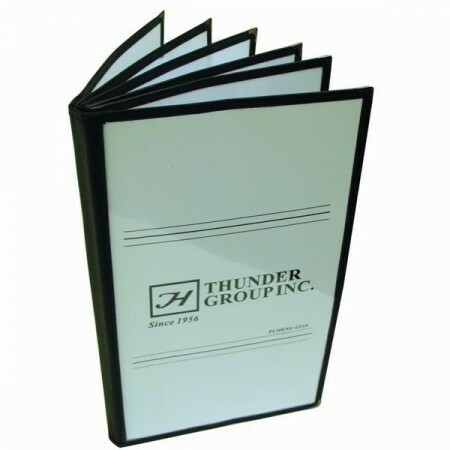 Featuring a clear plastic laminated cover, this piece allows for the easy viewing of your menu items. Stylish and elegant, this menu holder is crafted with gold metal corners. This piece comes in a classic black color to easily match a variety of restaurant decors.